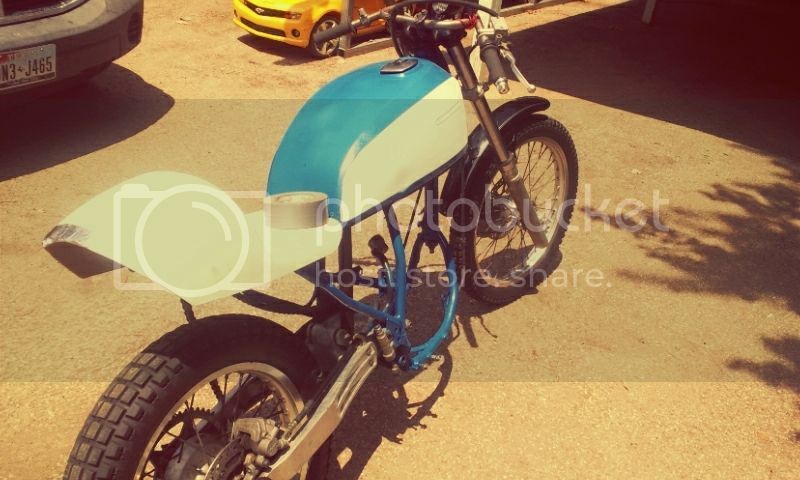 using a streetbike front end on a dirtbike that is being converted into a cafe racer? i'm guessing many of you reading this have seen my dr250 dirty cafe thread, in which i detail the saga of my moneypit dirt bike cafe racer. i always feel like the project is on the verge of being done and on the verge of being trashed. right now my list of stuff to do seems short, to me. right now i have a rear shock and linkage coming from an sv650. i also have a little red intake on it's way. im should be picking up the gs500 front end either tomorrow or tuesday. i know it wont be a simple job, swapping out the front ends. i'm sure there will be much cussing and sweating involved. my main concern is if the axle doesnt work, what in the do i do next, if i want to keep the spoked dirt wheel...? i would be ok with a gs500 front wheel, i guess, but it would totally throw out the retro look i have going on. i think it would be about as wide as my rear, too, which would look cool, but idk. also, wheel spacers? will i have to get some made, or are they sold online somewhere? anyone know what all i can expect? how to fix it? thats the last glamour shot i have taken of the build. here is the actual thread. i made this one to get a little attention for the front end swap. i have never done one. i can see a swap from one generation gsxr to another being easy and pretty cut and dry, but from a streetbike front end to a dirtbike pretending to be a cafe racer? i'm a little nervous to see how this works out. Last edited by loosenoose; 06-18-2012 at 12:53 AM. ah, it's never cut-and-dry, but I bet we can figure something out without too much headache. The first (and biggest) question is whether the GS stem will fit your neck or if you'll need to swap the stem. also another potential problem is (if the stem won't swap over) if the GS500 stem is even long enough to go all the way through the dirtbike steering head. normally the dirtbikes have more distance between the upper and lower steering bearing to help with the extra forces from dirt riding. You're definitely going to have a few headaches trying to mount that front end, seeing as you kinda went blindly about researching what might be an easier swap. Easy. Just swap stems and go. I doubt it will be this way here. Not impossible though just not cake. also, a quick search shows that the GS500 axle is 15mm diameter, while the DR250 is 12mm. Of course you should double check this with what parts you have, but it is possible to make a thin sleeve to take up the slack. Remember though, at that point you are talking about a sleeve that has a 1.5mm wall thickness - not easy to machine..
Suzuki's cruiser line shares the axle size and width of the gs and is spoked. good thinking. Also, another site mentions that the dr250 axle is longer than (or needs longer spacers than) a gsx600 front end. That's a katana for all you new school'ers. so you are swapping front end for looks and not suspension? I was wondering why not just have the forks resprung for your weight, now I get it. With the dirt forks i would have to raise the rear to nearly stock dr height to prevent the wheel from flopping left or right. if i lower the front end in the triples i have to have about 4 inches of tube sticking out the top to achieve stability. a shorter fork, i think, is my best option. Wound up passing on the gs front end. a bit rougher shape than i had imagined and too far away. thanks though Jae. ill see what can be done to shorten the fork length and stiffen the ride. Loosenoose, Hope this comes up for you to check out. This may continue to inspire you to keep going with your build. Dirt bike chassis with street mods. You may visit with Rolands or his tech's for some rear sets make for the dr250. Not sure if the girl comes with it. A couple of those pics. i didn't see a bike. LOL... Yes, I know that was a problem I had for a moment or two. Rsd has provided some inspiration here. i love the super singles and would be stoked to have a 450 for the street. after having ridden a 650, 750, 250, and 200, i think a 400 or 450 would be optimal. rsd is not cheap though, and that has been a constant theme here, except for a few dime city cycles parts. i start an extra job this sunday. im trying to make some extra money to finish this . might keep at the job for a while though... sounds fun. i watch some troubled youths in this nice big house.